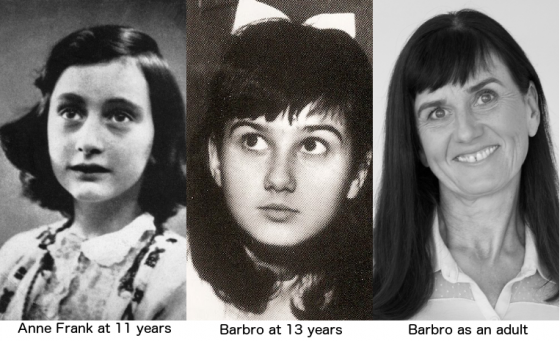 Anne Frank died in 1945, and less than 9 years later, she was reborn as Barbro Karlén. An accomplished writer and considered a child prodigy in her home country of Sweden, Barbro Karlén had 11 books published by the time she was 16 years old. As a young child, Barbro began having memories of a past life, which lead her to believe that her name was Anne Frank. Her Christian parents thought the details she shared were simply fantasies, and did not take her seriously. Barbro’s parents had never heard of The Diary, OR Anne Frank at that time. Despite this fact, Barbro, through her memory alone, led her parents to the preserved hiding place of Anne and her family. She pointed out landmarks and features of the house, which the curator confirmed, including a blank wall on which photographs were missing. To date, Barbro is considered to the be the only, and true reincarnate of Anne Frank. To learn more about Barbro’s experience, please watch the videos below, as documented by Institute for the Integration of Science, Intuition and Spirit (IISIS). You can also purchase her book, And The Wolves Howled. Born in Gothenburg, Sweden 1954. “I have had memories from my past life for as long as I know. First book published in 1966, “Man on Earth”, poetry book. All poems was written by the age of 7-11. It became, at that time, the most sold poetry book of all times in Sweden. Another 9 books published before the age of 16. Worked as a Mounted Police Officer in Sweden for 15 years. Moved to California in 1999. Became a US citizen in 2005. Lives in Mission Viejo, Orange County, CA. I have one son and 3 grandchildren in Sweden. based on the book “And the wolves howled, Fragments of two lifetimes”. a state of the art computerized horse.